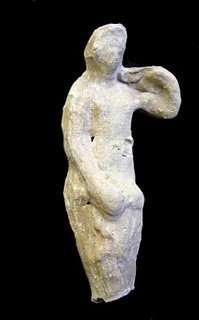 An ancient treasure comprising three figurines of Aphrodite, the goddess of love, which was buried for over 1,500 years, was uncovered during recent excavations in Israel. The hidden figurines were discovered when the researchers exposed a shop in the southeastern corner of the forum district of Sussita, which is the central area of the Roman city that was built in the second century BC, existed through the Roman and Byzantine periods and destroyed in the great earthquake of 749 AD. According to the researchers, it was clear that the followers had wished to hide the figurines, as they were found complete. To read the whole article follow this link. Pretty cool, huh? And sounds vaguely familiar. I love reading about lost treasures and the people who find them. Always inspires story ideas in my head. The other night I got sucked into a History Channel 6 part series called Clash of the Gods, which is all about The Odyssey and whether Homer’s epic classic is based on real-world events. They’ve actually found evidence of war inside the walls of Troy and a ship at the bottom of the sea that corresponds to the time Odysseus would have sailed through that region on his voyage home. The wood, the construction methods all mirror those described in The Odyssey. Fascinating. Something else that’s fascinating is that I’m the featured author this month at The Novel Blog! Since I’m the first romance author they’ve featured, I’m very flattered to have been chosen. And the header graphic they put together just looks awesome. Stop by and check it out!